Halloween NOTES Volumes of Treats Get out those trick-or-treat (book) bags! This Halloween, youngest booklovers are rewarded with a pair of board books featuring favorite characters. 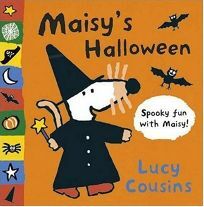 In Maisy's Halloween by Lucy Cousins, the bewitching mouse in pointy hat leads her crew in festive regalia from Eddie the elephant's crown and scepter to feathered Tallulah's fairy wings and magic wand. (Sept.) .